Clackamas County TSP - Virtual Workshop #3 - East County | Kittelson & Associates, Inc. Thank you for taking the time to comment on the projects under consideration for inclusion in the Clackamas County Transportation System Plan Update. The map to the right display the projects based on their current draft tier. You can zoom in to see areas of the map more closely. You can turn the layers shown in the green box to the right on and off by clicking on them. Click on a point or line on the map to bring up a blue box displaying more information about the project. To provide feedback on a project, click on the link “Add Comment” in this blue box and a comments box will appear to let you type your comment. 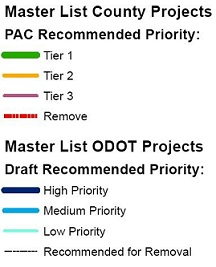 Please select a category to specify whether you think the project should be in Tier 1, Tier 2, or Tier 3. You may also select “Remove” if you think the project should not be on the list at all. Having trouble viewing or using the map? Please contact Kelly Laustsen at klaustsen@kittelson.com with your comments.